I have not had a chance to play yet. Just watched a few of the online sessions on YouTube. Have the rules on levels seen much use? I only saw one GM mention the level difference as a modifier. Also, do they work the other way? In ex. your level 5 pilot fighting 1 Hd « hoppers » at (beneficial) +4? That would simulate nicely the mid-season trope where your heroes are now mowing through the basic troops that gave them trouble initially. Or does the hitpoint difference is enough for balance? Hey Jean-Francois! Rules-as-written, there's no reverse modifier for enemies with a lower HD than the mecha. This is mostly handled by virtue of the mecha having better stats, more HP, and more modules. However, you could easily build this rule into your own games without breaking the system, and achieve that "mowing down enemies" feeling you're looking for. Thanks for the question! After watching a few more videos I see it balances pretty well. Maybe I’ll just keep it in mind for a « mid-season special » and then go back to normal. I clearly need more time to play! I've been intrigued by this one for awhile but haven't bought it yet. Would it be possible to use this for PvP types games similar to Battletech? Hey Jeremy! Currently there aren't rules in the book for PvP, but it'd be fairly simple to hack some using the base system. I've heard from a few people that they love this system for running BattleTech because of the reactor die system for overheating. Have you thought on getting this translated into other languages? I am particularly interested in Spanish. Hey there! We hadn't really thought about that, but we will definitely consider it! Are there any plans for a print version of this book? Or for Print on Demand to be made available? Hey there Scott! As Asher pointed out, we do have a print version available for pre-order on Absolute Tabletop's online storefront, which includes a free copy of the PDF. 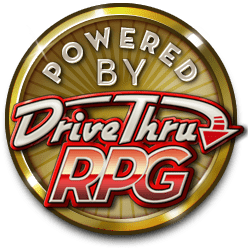 We will be offering print-on-demand copies here on DTRPG as well eventually. Thanks for the question!